The last few decades have witnessed substantial liberalization trends in various industries and countries. Starting with the deregulation of the US airline industry in 1978, regulatory restructuring took place in further network industries such as telecommunications, electricity or railways in various countries around the world. Although most of the liberalization movements were initially triggered by the worrying performances of the respective regulatory frameworks, increases in competition and corresponding improvements in allocative and productive efficiency were typically associated with the respective liberalization efforts. From an academic perspective, the transition from regulated industries to liberalized industries has attracted a substantial amount of research reflected in many books and research articles which can be distilled to three main questions: (1) What are the forces that have given rise to regulatory reform? (2) What is the structure of the regulatory change which has occurred to date and is likely to occur in the immediate future? (3) What have been the effects on industry efficiency, prices and profits of the reforms which have occurred to date? Liberalization in Aviation brings together renowned academics and practitioners from around the world to address all three questions and draw policy conclusions. 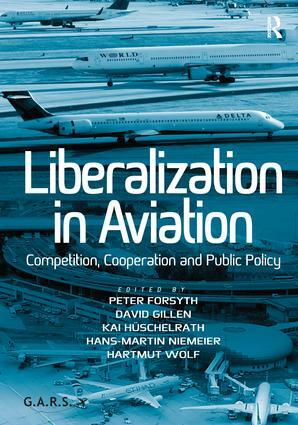 The book is divided into five sections, in turn dealing with aspects of competition in various liberalized markets, the emergence and growth of low-cost carriers, horizontal mergers and alliances, infrastructures, and concluding with economic assessments of liberalization steps so far and proposed steps in the future. Peter Forsyth has been Professor of Economics at Monash University since 1997. His research has been on applied microeconomics, with particular reference to the economics of air transport, tourism economics and of regulation. He has recently published a jointly edited book on Airport Competition the European Experience, Ashgate. Recent work has involved using computable general equilibrium models to assess the economic impacts of tourism, including events, and in analysing tourism and aviation policy issues. David Gillen is YVR Professor of Transportation Policy in the Sauder School of Business and Director Centre for Transportation Studies, University of British Columbia. In addition he is Research Economist at the Institute of Transportation Studies at the University of California, Berkeley. David has published more than 100 books, technical reports, journal papers, conference presentations and other articles in various areas of transportation economics, including airline competition and industry structure, airport economics and noise externalities, and transportation policy in Canada and the United States. Kai HÃ¼schelrath is Senior Researcher in the Department of Industrial Economics and International Management at ZEW Centre for European Economic Research in Mannheim, Germany. In addition he is Assistant Professor for Industrial Organization and Competitive Strategy at WHU Otto Beisheim School of Management in Vallendar, Germany. His research focuses on various areas of competition policy and competitive strategy including market definition, collusive practices, mergers and market entry. Hans-Martin Niemeier is Director of the Institute for Transport and Development of the Bremen University of Applied Sciences and Chairman of the German Aviation Research Society. He is known for his work on airport privatization, regulation and performance of European airports. A former airport regulator, he has previously conducted studies on the market power of Amsterdam airport, the role of benchmarking in incentive regulation of European airports and the performance of Norwegian airports. Hartmut Wolf is Professor of Trade, Logistics and Maritime Economics at the Flensburg University of Applied Sciences. In addition, he is associated Economist at the Kiel Institute for the World Economy. His research focuses on international transport markets and institutional aspects of the provision of infrastructure services and institutional economics.